If you’re stuck for something to give to that special person in your life, why not treat them to a full day taster of individual tuition in blacksmithing. Using a traditional coke forge students on the course design and then make their own item to take home with them and are treated to a hearty lunch. 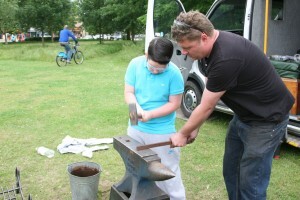 Using the seven basic techniques in blacksmithing, participants always go home inspired.